The Yukon 6-100x100 is a revolutionary spotting scope that provides high quality image at magnifications ranging from 6x from 100x. 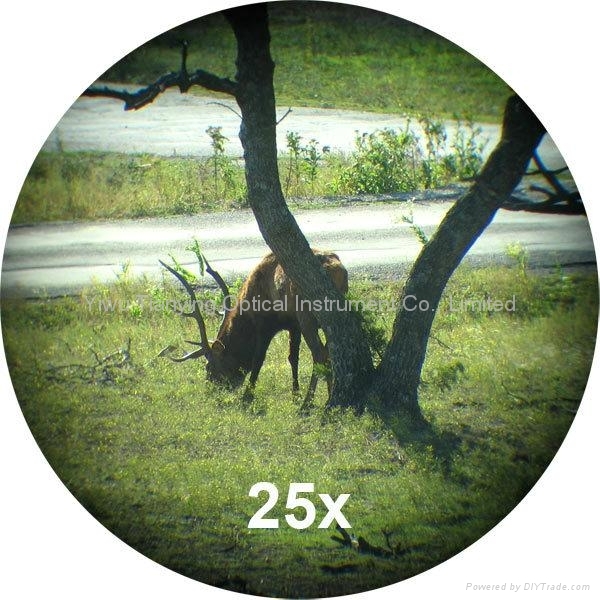 For low magnification observation, the device utilizes the 25 mm lens. 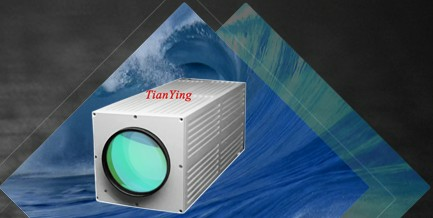 Linear zooming allows magnification adjustments between 6 and 25x. When more magnification is desired, the flip of a switch shifts the light path from one lens to the other. With the 100 mm objective lens, zooming capabilities increase to 25-100x magnification. The enormous light gathering capability of the 100mm lens creates a bright and clear picture in nearly all viewing conditions, including twilight. In accordance to Yukon Advanced Optics' tradition, the Yukon 100x's design provides the user both power, quality and comfort. To prevent viewing fatigue or discomfort, a specially designed adjustable 45-degree, rotating eyepiece is utilized to suit the viewer's comfort from any angle, even when lying on the ground. Both digital and photo camera adapters are available to be used with Yukon 100x.The unit accommodates both photographic and spotting scope tripods and can double as a telescope for late night stargazing. This manual will help familiarize you with the features, operations and maintenance of the Yukon 100x Variable Power Spotting Scope. The unique design of the scope utilizes a dual light path optical system. 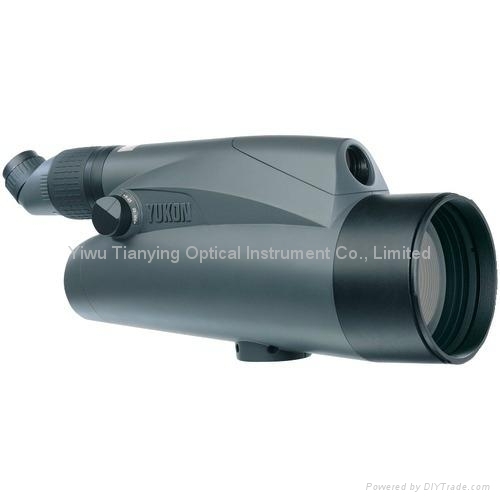 This design allows the scope to provide high magnification and image quality in a compact body. 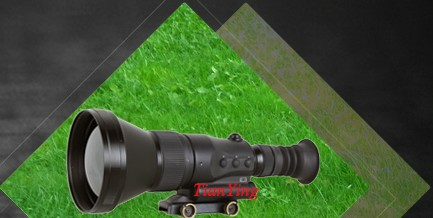 In order to attain the magnification range, the Yukon 100x is designed to gather light between the scopes' two objective lenses of 100 mm and 25 mm. The 100 mm objective lens has great light gathering capability that allows the use of this scope effectively in twilight conditions as well as in the light of day. The usage of the two objectives with switch effects to reach significant change of magnification from 6x to 100x. The Yukon 100x Spotting Scope has an offset eyepiece that allows a user to be more comfortable in any position during observation. 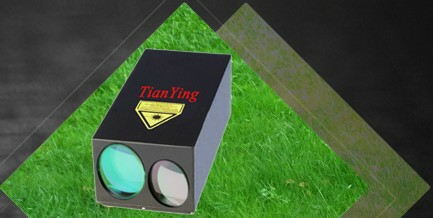 The device is available in two modifications: straight and angled rotating eyepieces. 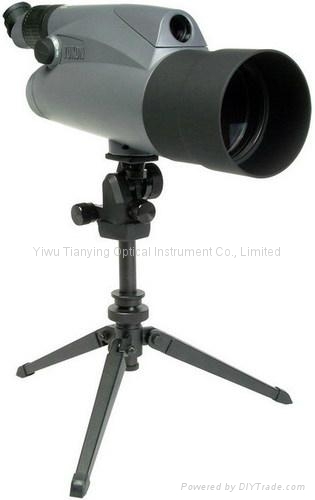 The straight eyepiece spotting scope is designed for observation in basic conditions, and the user can simply position himself comfortably behind the spotting scope. The angled rotating eyepiece spotting scope is the better choice if a comfortable position needs to be found around the scope. · Store your Yukon 100x in a dry, warm, well-ventilated room. · Keep the Yukon 100x away from any heating and air conditioning vents or other heating devices. · Keep the Yukon 100x out of direct sunlight, dust, and moisture. Additional precautions include avoiding any sudden or extreme temperature changes. · Avoid dropping or otherwise shocking the unit. Although designed for rugged outdoor use, the Yukon™ 100x incorporates a sophisticated optical system, which could be damaged in extreme cases of misuse. · Clean optical parts (lenses) with professional lens cleaning supplies designed for use with multicoated optics. Damage to this device from failure to observe these warnings may void the warranty! Prevent use of spotting scope Yukon 100x in direct sun light. WARNING! NEVER OBSERVE THE SUN EITHER DIRECTLY OR WITH THE OPTICAL DEVICE. · Remove the scope from the carrying case. · Mount the device on a tripod and adjust the necessary height. · Remove protective lens caps from the objective lens (1) and the eyepiece (2). 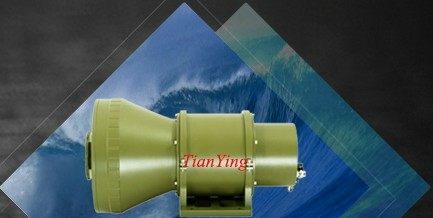 · Place the switch of the objective lens (3) in the primary position of 6 -25x. · Adjust the variable power mechanism (4) to a desired magnification. The top line of the magnification display (5) indicates the current power selection for the light path of the 25 mm lens. The bottom line indicates the power of the 100 mm lens. · Adjust the position of the eyepiece to a comfortable level by turning the ocular body (6), when your Spotting Scope has rotating eyepiece. 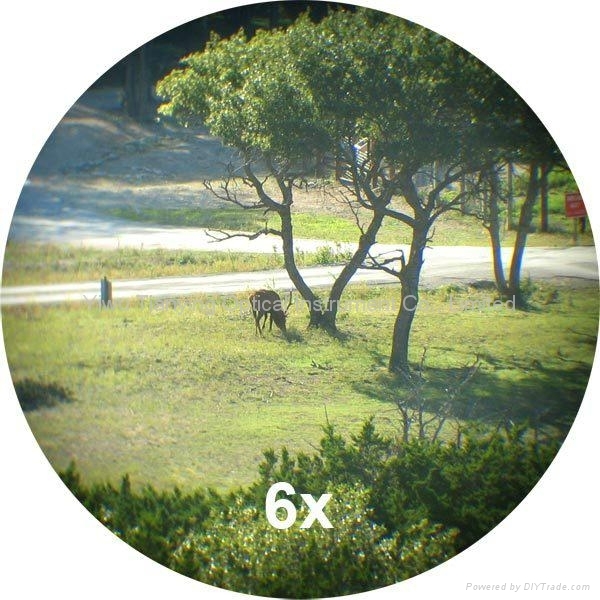 · Bring image into focus by turning the eyepiece (2). · To switch the light path to the 100 mm lens and achieve 25x -100x magnification, turn the objective lens switch (3) to position 25-100. Adjust the magnification as desired referencing the bottom line of the magnification display. 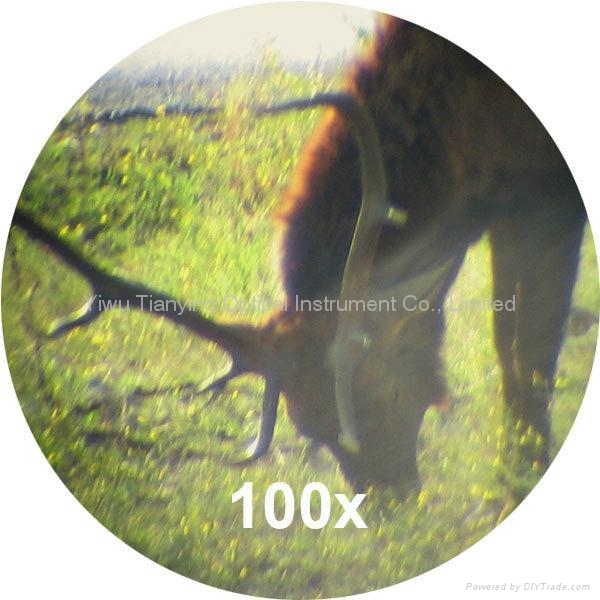 · Focusing is achieved by turning the eyepiece (2). · To preserve the scope in adverse weather conditions and to make it more versatile, the Yukon 100x can be used without removing the carrying case. To utilize this feature, safely mount the scope on a tripod through the opening in the case positioned against the tripod sockets. Open and fasten with Velcro in the open position the front lens cover and the rear flaps covering the eyepiece. · To reduce glare, remove the lens hood (1), turn it round and attach to the bayonet at the front of the scope. · clean the lenses with professional lens cleaning supplies intended for use with multicoated optics. · blow any dust or dirt off of the lenses using dry, compressed air. · clean the Yukon 100x housing with a soft, clean cloth. The Manufacturer warrants its products against defects in materials and workmanship for a period of three years from the original date of a purchase. Any device returned for warranty service must be judged by the Manufacturer as having been used according to its original design intents. As such, misuse, neglect, or any abnormal use is not covered by this warranty. The Manufacturer will repair or replace such products or parts thereof, which, upon inspection by the Manufacturer, are found to be defective in either materials or workmanship. 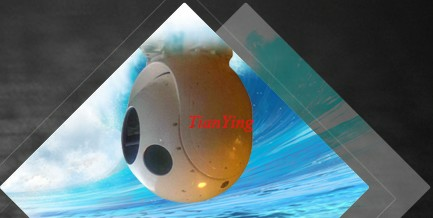 As a condition of the Manufacturer's obligation regarding warranty work, the product must be returned directly to the Manufacturer with a satisfactory proof of a purchase. It is highly recommended that you fill out and return your warranty registration card to ensure the warranty coverage. This warranty is null and void if equipment has been altered, tampered with, modified, or otherwise abused, mishandled, or subjected to unauthorized repairs. The Manufacturer disclaims any other warranties, either expressed or implied, except as expressed herein. The sole obligation of the Manufacturer is to repair or replace the covered device.